It is the end of the fall semester and I am done with reading final papers, and grading final tests. It is a lot of work but it is rewarding to see how students have progressed, learned, and matured. Through hard work we all have become, in some way or another, better persons. This last months have been very difficult, traumatic but for sure have provided lessons with deep understanding that will take many years for them to be debriefed. Yes, I am talking about the presidential elections in the US. Elections that produced to certain extent unexpected results and created a political situation that will have grave economic implications. Many of us, the so called middle working class, are going to be negatively affected. For example those of us who depend or will depend on Medicare and Social Security will be hurt as these social programs will be gutted. There is much we can do and must do to keep progressing in the right direction. Thinking and acting come together as thoughts and choices come together. It is a mistake to separate outcomes from attitudes, to separate achievements from goals. It is all about having the right attitude, the right mindset that will guide us to success. This is why when I teach I tell my students: If you are not having fun you’re not learning! It seems a bit eccentric to say this, as many would argue that learning is hard work and that hard work can’t be fun. Here I have to ask myself what do I mean by having fun? As we grow up having fun would mean doing something without paying attention, leisurely without fear of consequences. Fun things are those we do for pleasure, where we don’t have to be forced to do it like work that it is paid to be done. In fact one definition of work is: something you do for money. Work is not something you do for pleasure, that would be fun. That would be play. It might be a lack of literacy from my part but I refuse to accept the narrow minded definitions of work and fun stated before. If by having the positive attitude of doing what you love or loving what you do, then anything you do can be fun, even if you are paid to do it. Human have free choice and the most important choice we make is how we take the life we have to live. In school we ask our student to do things like reading and working with exercises outside to the class. It is called “homework” as we can call it anything I call it “homejoy” because doing it should produce a good and positive sense of accomplishment. Going to school is a privilege that only a few people in the world have, going to a higher education is even more of a privilege; so doing what is required to succeed should be a source of joy. As with education, life should be considered a privilege. One must live every single day remembering that it is a privilege to be alive. Even when the situation political, economical, or social looks like is a disaster. And in many cases it is, what can I say about what is going on in Aleppo? It is for sure a sad and terrible human disaster. Next step is to do something about it. Everyone within his/her own means has to do something about it. My goal is to have some influence in my students, to help them be better persons. Help them to find joy in everything they do no matter what. Even as I recognize that we are all different we all can come together for the good of the community, for the good of the global village that we are part of. This is a great post. We can always do better, and I mean always! 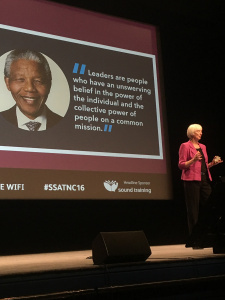 Last week I was fortunate enough to attend the SSAT National Conference. It was a great two days with some inspirational speakers – many of whom I got some great ideas from. The highlight though was listening to Baroness Sue Campbell. Sue was made Chief Executive of Youth Sport Trust in 1995 and has been Chair of UK Sport since 2003. 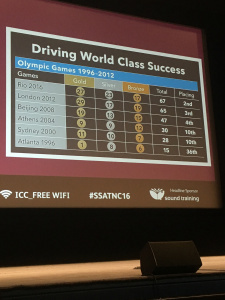 She started her talk with the Olympic medals table (left) which illustrates the amazing legacy that this remarkable leader will leave. Sue said that whilst financial investment into UK Sport had undoubtedly played a role, more important was culture. In Sue’s words ‘Culture is about people and a belief’. However, she also pointed out that you can’t just impose this belief on people, you need to learn about the people you are working with and take them with you. This is what the best leaders do.